I was born in Managua, Nicaragua. From a very young age I've been interested in photography and other arts. I arrived to Marin County, CA in 1985. For the last seven years I have worked as a computer programmer, systems administrator, and computer technician. I am a self taught Photographer/Artist. I love the photographic medium and having the freedom to express artistically my always-evolving style. I like producing creative and unique images. As I update my Portfolio, some of my work becomes experimental with light, shadows, depth of field, etc. I am extremely open-minded and can always find new inspirations. I'm always willing to work with my subject to create imaginative and unique photographs of them. I love photography. 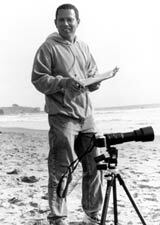 I bought my first camera in 1994 and decided to take a photography course at the New York Institute of Photography, and at the Marin Community College. For the last 5.5 years I have worked as a Freelance Professional Photographer, specializing in fashion & glamour, portraiture, headshots, product, print, stock photos and fine art. I've photographed actors, fashion models, models in general and regular people. My photos have been published in three different magazines. I have won first place, third place and an honorable mention in three different Marin County photography competitions. My photos have been exhibited at the Marin County Fair. I'm experienced in 35mm films and digital imagery, Photoshop and some Macromedia web design software.